My gateway to the 60s! I became a member of this well-known country/oldie/rock institution around 2000. 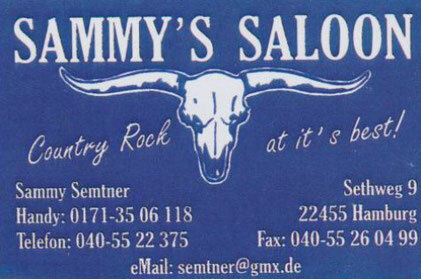 Sammy was part of the Hamburg beat scene that evolved from the Beatles' appearance at the Indra, Top10, and finally Star-Club. I learned so much from this man, and I respect him as my somehow "Hamburg scene dad", hahaha! His band back then were the very well known Dirty Dogs, and it's great to listen to his stories from the Reeperbahn, stories full of music, rebellion, sin, booze, Rock'n Roll. Being 50+, it's a funny feeling to become the young greenhorn when we join on stage because this guy next to me is well above 70. No use fakin' it, this man can tell, 'cause this man's through it before! 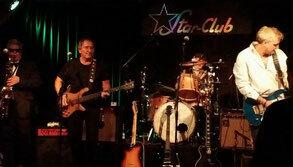 We are joined by Wolfgang Csenteri, my mate from Yamaha on the drums, Jason Jones (JonesGangster in his own right), and just recently by Frank Elwart from YONKS' hall of fame. 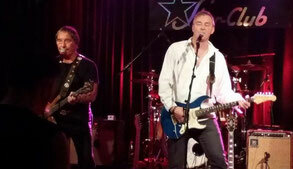 Some impressions from our gig at Downtown Bluesclub, Hamburg, late November 2014. There's more to find on YouTube, folks!